A True Gulf Front Townhouse (4 Bedroom, 3.5 Bath). Great Views, Great Location and Great Rates. Two gulf front bedrooms. Thank you for your interest in my beachfront / Gulf Front property in Destin / Miramar Beach, Florida. I would be very happy to have you as my guests and hope that the information provided below is helpful to you in your vacation planning. Please see owner's website; BeachRoad98 for additional description, pictures. More property reviews are also available on different websites. "PLEASE EMAIL". Please read the "note section" of the rates and call if you have any questions. I am the owner and personally return all calls. This beautiful tri-level is approximately 1700 square feet in size and is completely furnished. Full kitchen, 2 washer, dryers, dishwasher, microwave, 4 LCD TVs, 4 Blue Ray DVDs, 2 Private Balconies, WIFI and a private deck are but a few of the amenities. The rental rates are extremely competitive. The four bedroom three and half bath sleeps 10. (5) 4th bedroom: A queen bed. Sleeps 2. Two restaurants are within walking distance. Two grocery stores are less than 2 miles away. Sliver Sand Factory outlet is within 2 miles. This unit is manged by the owner. No Management Company. Please let me know if I can answer any questions and help you finalize your vacation reservations. 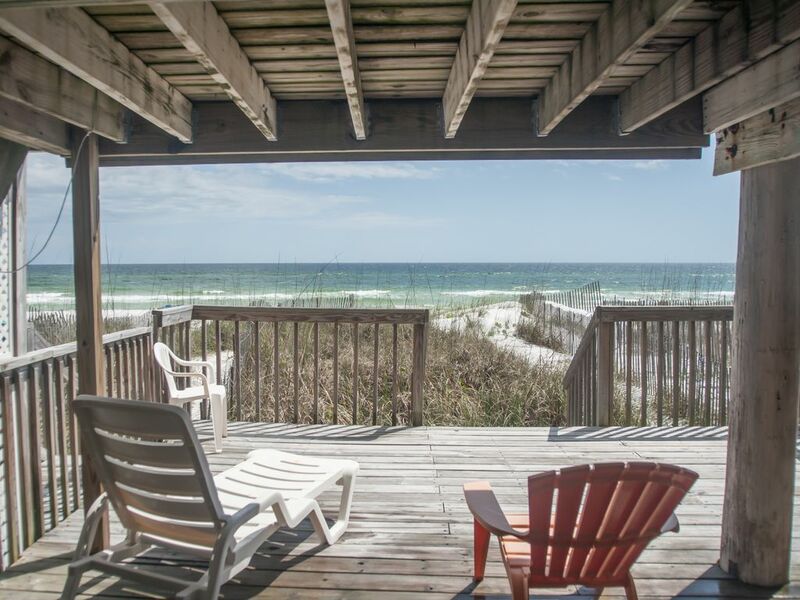 Best location in Destin or Miramar Beach on a private beach. Close to shopping centers, grocery stores, coffee shops and within walking distance to a few restaurants. You can park in front of this unit, walk-in and walk from the back balcony on the pure white sandy beach and less than 60-70 feet from the water. Two gulf front balconies. Access to the beach is available from either balconies. Three out of the 4 bathrooms were totally remodeled last year. Right on the gulf of Mexico. No street to cross. This unit is beachfront. You can not get any closer to the water than this unit. It is only 50 feet from the water. No street to cross. All linens are provided. Please bring your own beach towels. (2) There are two washer and dryers in this unit. They are located on the first and third floor. Two cars can park right in front of the unit. Two additional cars can park behind the first two for a total of 4. But there is not enough space for 4 big SUV like Chevy Tahoe. Towels are to be used inside the unit. Guests are responsible for bringing their own beach towels. Very quiet Bosch dishwasher is in this unit. A brand new microwave oven is in this unit. All dishes and utensils are provided. All appliances are brand new and installed on Dec 30th 2011. They are all stainless steel. There are 4 LCD Tvs in this unit. They are all 40"
(4) There are 4 LCD Tvs in this unit. They are all 40"
(2) Two balconies. On the first and the second floor. Access to the beach is available from either. This true gulf front unit is in the perfect location. Two private gulf side balconies. lots of windows. Beautiful private beaches, close to shopping and restaurants.